Digitising this thesis collection is an act of time travel. We began in May at the early twentieth century and are currently working through the seventies. We have enjoyed images of a man in a beautiful three-piece suit coaxing a snake into a glass tube from the twenties, and are currently being treated to some majestic large collars, trousers and hair from the seventies. Not only do the fashions change, but the technology changes as well, from hand written, to meticulously typed on typewriters, and finally to modern computers, which we have yet to encounter. In this way the PhD thesis collection is a litmus test for the technological development of the society from which it emerged. The collection is also an indication of social development. It cannot be denied that the authors of these theses are not representative of society en masse, but a highly educated, largely male minority. But these are not the only people bound within these volumes, and one could argue not the only creators of these theses as physical objects. I am fascinated by the names of countless women who worked tirelessly to create this collection. These are of course the professional typists who pieced together chapters, created tables and graphs and read handwriting that seems to have been often rather illegible. I encounter these women in the acknowledgments section of the theses. I find this particularly amusing because presumably in order to be thanked in the thesis they needed to type their own acknowledgement. I have been taking note of these women for about three weeks now and so far about 40% of the volumes I have encountered contain acknowledgments to typists. I don’t know if these means the work was typed by its author or if the typist’s name just hasn’t been included. I have recorded sixty different women. Only two women, Helen Scott and Anthea Cormack, have been named twice. Cormack typed two theses addressing fibrinolysis, whereas Scott typed one PhD in chemistry and another MD about the liver. Therefore I’m not sure whether typists specialised in certain topics or not. I have encountered one example of a man typing a thesis for a women, Maureen Child completed her thesis entitled ‘An ethological study of social interaction among nursery school children’ in 1978. She thanks Nick Child, perhaps a relative, for typing her thesis. These names will not be on the catalogue, they did not receive a new title for their work, and presumably within a decade or so their skills were no longer required. I have managed to find very little information about typists working in Edinburgh in the 60’s, 70’s and 80’s but clearly there were several. I would like to type an acknowledgement to them so they don’t have to do it themselves for once. Hello, I’m Pete Marsden one of the digitisation assistants working out at the Gyle in West Edinburgh, and this is what I get up to…….. 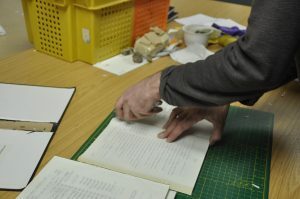 Here is a sneak peek behind the scenes at the library annexe where the thesis digitising team are hard at work. We have over 20,000 theses, most of which are duplicates, to scan over the next 18 months. The theses are double checked on our spreadsheet to ensure that they are indeed duplicates and haven’t previously been scanned, when we are happy with this, the thesis has its boards removed with a sharp knife. 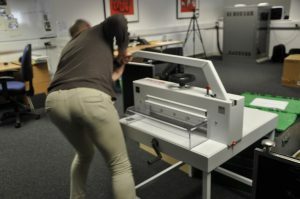 The next stage is to remove the binding using a manual guillotine and a bit of elbow grease. The thesis is now ready to move on to the scanning stage. 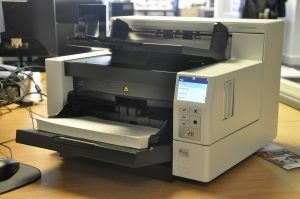 A Kodak i4250 document scanner is utilised for this step, this scans at 150 pages per minute producing pdf format files which are then sent to the image processing stage (more of which later). Next time we will look at the image processing using Limb software.